Manager David Healy saluted hat-trick hero Andy Waterworth as Linfield returned the top of the League table following the demolition of Cliftonville at Windsor Park on Saturday. It was the type of performance that had genuine title contenders written all over it. The result almost certainly torpedoed any lingering hopes of Barry Gray’s Reds having an impact in the Danske Bank Premiership title race – they are now a whopping 11 points adrift of Linfield. It’s always a feisty affair when the teams meet, and the rivalry was hyped up even further as both teams decided to abandon the pre-match handshakes – a spill over from last season’s Irish Cup final when Cliftonville protested against the national anthem being played. But there was just no stopping that man Waterworth, who took his goal tally for the season to 17. Jimmy Callacher got the show on the road by heading the Blues into the lead before Waterworth took centre stage. 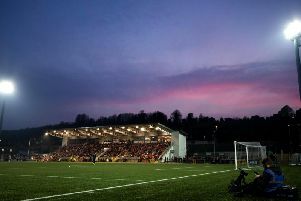 The Reds, however, did manager to struggle back off the ropes on two occasions with goals from Joe Gormley – his 21st of the season – and Jamie Harney. But had it been a boxing match, referee Tim Marshall would surely have stopped it long before the finish. “I thought some of our play was excellent,” beamed Healy. “Our movement, our energy and our fitness levels were good . . . we pressed the ball all over the park. “We should have been out of sight by half-time – we were good and the score line didn’t flatter us, that’s for sure. Credit to the players, apart from the two lapses for their goals, I thought we were very good. “They created one chance in the first half and it fell to Gormley and, even though Cliftonville were not at the races, we all know the damage he can do. His goal brought them back into it. Had we been three or four up, it wouldn’t have flattered us. “I’m often asked, can we win the title? My answers is, absolutely! It’s been like that since the first minute I walked in through the door of this club three years ago. “That’s always my goal. I’m not going to hide away from it. I’m not saying we are going to win it, but are we capable of winning it? Absolutely. The former Northern Ireland striker also heaped praise in the direction of talisman striker Waterworth. “I’ve been on Andy’s case for two years now about getting across the front of defences and attack the near post,” claimed Healy. “He did it today and hit the jackpot. Andy has had to try and adjust. He is not as quick as he was a few years ago, so we have worked on different things to get the best out of him. Cliftonville boss Barry Gray admitted his boys out fought and out thought on the day. “It was a sloppy score line for us,” he said. “Had we been beaten by the odd goal, we could be coming away with some plusses. In the first half, at two-nil down, I’m thinking this could be a long day. “Then we got one back before the break that altered the dynamic of the game. We started the second half fairly, well, but we went asleep and were hit with a third goal. “Some of our frustrations of today are the same frustrations that I’ve been going on about over the past few weeks. I am really, really, really concerned about our level of work rate – I’m really worried. “We conceded four goals, but did Linfield have to work for them? I’m not taking away the quality of Waterworth’s finishing, but it was made easy for him. “In my opinion, when things are difficult, you work harder. When things get even tougher, you work harder again and continue that theme until you come out the other side.